I’m very pleased we did the walk. As we were staying on Malta for 3 weeks it put some structure to our holiday and certainly made me look at Malta differently when I decided I would write about our “adventure”. The manners of some of its inhabitants improves. The amount of litter is reduced – some of the coastlines were awful. Dog owners take responsibility for removing the "poo" that their pooches “dump” on the footpaths. Pavements and disabled accessibility are improved. However, I suppose with regard to these aspects it's not much different to England. The scenery and sea, particularly in the north western corner of the island, is wonderful. The Maltese Bakers make some terrific bread and cakes. If you like churches, there are plenty here. Valletta is a lovely place to visit. Even in March the weather is usually very good. And I don’t know anywhere else where I can buy Kinnie. Since 2004 we have returned to Malta on three occasions. The first time we stayed at a Hotel in Marsascala which is a very pleasant resort with good walking available. We particularly liked the wide promenade, ideal for an evening stroll to the local restaurants overlooking the harbour. On the other two occasions we stay in Mellieha Town. This, from my knowledge is the best place to stop on the island for walking. 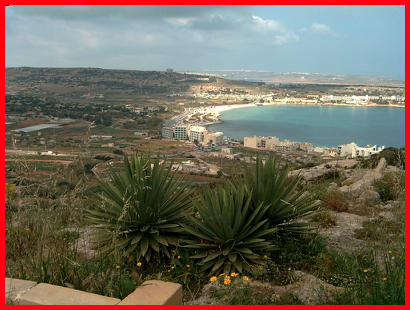 If you go downhill north west you are soon in Mellieha Bay with the countryside of Marfa Ridge beyond. Going east and west the countryside is very unspoilt and the scenery, particularly the rugged coastline, is spectacular. And it is very pleasing to report that things have improved considerably since 2004, particularly pavements, disabled accessibility and public toilets which I presume have been at least partly financed from European Funding now that Malta is a member of the European Union. With regard to other concerns certainly in the Mellieha Area dog fouling and litter was less prevalent than I had notice in 2004. However, with regard to the manners of the some of the inhabitants they may have improved but even with improved buses the bus drivers are still generally less than ‘friendly’.